Cute card. 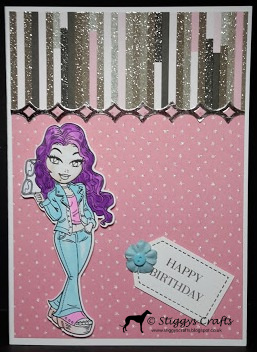 She's rocking the purple hair :-) Thanks for sharing with us at Crafty Catz this week. Thanks for joining us at KennyK's Krafty Krew. Good luck in the drawing. I hope to see you again soon. This is perfect for any Birthday Girl! Like the colours and papers you picked. Thank you for sharing with us at KennyK. Good luck!